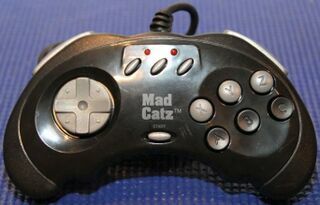 The Mad Catz Advanced Control Pad for Saturn is a third-party controller for the Sega Saturn developed by Mad Catz. The Advanced Control Pad is effectively a Mad Catz Control Pad for Saturn but with added turbo features. A version was sold in Europe by Gamester who used their own branding on the product.